Bed Races This Friday in Mocksville ~ Whacky, Whimsical, and Outrageously Fun! 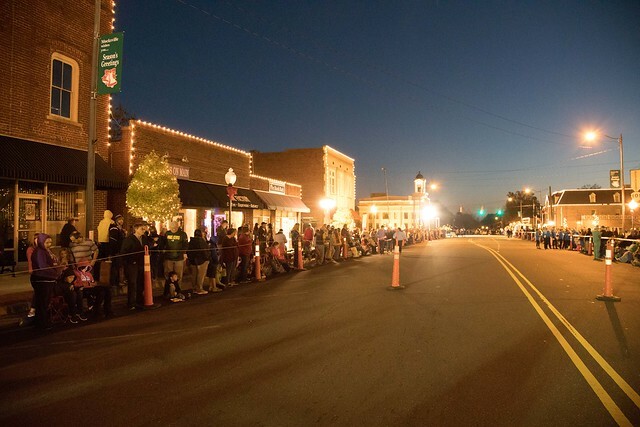 Historic Downtown Mocksville will race into the Christmas season this Friday night, November 16th as 25 whacky, whimsical, and outrageous teams from local businesses, non-profits, and WXII-12 News take part in the 7th annual “Twas the Night Before” Bed Race. The festivities will begin with the lighting of the downtown businesses at dusk. WXII News Reporter Briana Conner will take on WXII Chief Meteorologist Lanie Pope at 6 p.m. followed by the Parade of Beds at 6:15 p.m. led by the Super Girls from the Mocksville Police Department. $600 in Cash Prizes at Stake! At stake are prizes for speed and creativity. The fastest team will take home a cool $200 in cash, while the runner-up will collect $125 and the third-place finisher will roll away with $75. The fastest senior team will receive $100 and the Most Outrageous team will pick up $50. The Total Package prize of $50 will go to the team with the best overall package… i.e. best overall appearance and combination of bed decoration, message, and costumes. Enjoy Photos from the 2017 Bad Races! Like any sprint, the goal of the bed race is to go from point A to point B in the shortest time possible—but these recumbent racers do have to follow a few basic rules in order to compete for the bevy of cash prizes. Each team consists of four pushers and one rider, all at least 15-years-old, and the rider must sit or lie flat on the bed during the race. Themed clothing or costumes are strongly encouraged, even pajamas are appropriate. Main Street from Gaither Street to the ­­­­­corner of Main Street/601/64 ­­­­­­­­­will close at 5:30 pm in preparation for the race. Plenty of bleacher-seating will be available. Support the Davie High War Eagle Band by grabbing a treat from their Dewey’s Bakery Store before the parade begins. O’Callahans, Restaurant 101, The Factory Coffeehouse, and Scoops will be open for hungry spectators. Michael Burton’s Smoke Wagon will be serving barbecue, smoked chicken wings and pronto pups near Sadie’s Unique Boutique on North Main Street; 601 Filling Station will be selling burgers, hot dogs, soups, and drinks and Goble Concessions will be selling hot cocoa, coffee, drinks, funnel cakes, and popcorn near Four Oaks Tavern; and Curtis Chalmers will have both hot and cold drinks and shaved ice near Restaurant 101 in the quad. For more information about the “Twas the Night Before” Bed Race contact the Mocksville Tourism Development Authority at (336) 753-6705.